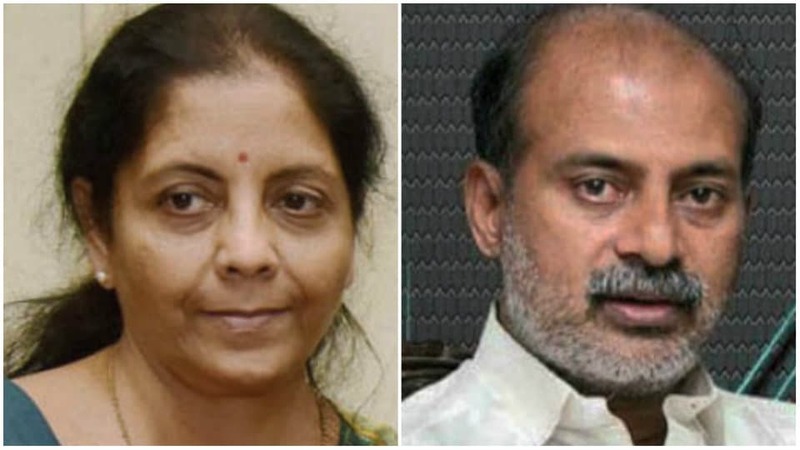 New Delhi: A day after Defence Minister Nirmala Sitharaman’s spat with Karnataka Minister S.R. Mahesh in Kodagu, the Defence Ministry yesterday said that it was unfortunate the way he behaved and described some of his subsequent personal remarks against her are in bad taste. Sitharaman, who was elected to the Rajya Sabha from Karnataka, was on a tour to flood-affected Kodagu district on Friday. She had a spat with Mahesh and her remarks expressing displeasure against Mahesh at the Deputy Commissioner’s office in Kodagu were telecast by TV channels. In an official clarification, it referred to media reports that she got angry with Mahesh during the flood review meeting with the Kodagu District Administration and said that Mahesh’s remark lowered the dignity of the Rajya Sabha which showed utter lack of regard and knowledge about Indian polity. Sitharaman said that the programme for the flood affected areas was finalised by the District Administration in consultation with the public representatives. It was approved and circulated to all concerned two days before her arrival. Subsequently on the request of the District Administration, an interaction with ex-army veterans was added to the schedule. The Defence Minister said, on completion of the field visit as per the programme, she was interacting with the ex-servicemen who were affected by the floods when Mahesh objected and insisted that the meeting of the officials must be conducted first. She clarified that welfare of the ex-servicemen was an essential part of the Defence Ministry and the same was scheduled in the programme. However, Mahesh insisted that she immediately stop the interaction and proceed to the meeting with the officials. “While it was extremely unfortunate, in order to avoid the situation from deteriorating, Defence Minister immediately halted the meeting and proceeded to the venue of the meeting with the officials. The venue was already set up for the press conference and hurriedly the officials were summoned to sit among the media persons for the review. It was unprecedented to hold a meeting with the officials, with all media persons present,” the clarification said. The Ministry also said there has been gross misinterpretation with regard to the use of the term ‘parivar’ by the Defence Minister during the press conference. It maintained that one of the four Departments of the Defence Ministry is the Department of the ex-servicemen welfare and in that context, it was stated that all ex-servicemen were part of the Ministry of Defence parivar. Meanwhile, in Madikeri, S.R, Mahesh said that the Union Minister lost her cool as he pointed out violation of travel protocol and accused her of discriminating against Kodagu people. “It was unfortunate that she did not announce any financial aid,” he said. Stating that officials cannot lose time as they need to be on the ground for relief works, he said that Nirmala was holding a meeting with other persons. “After that, she was leaving for another meeting. So, I had to point out that officials should not be made to wait in the present situation,” Mahesh said. Deputy CM Dr. G. Parameshwara accused Sitharaman of “lashing out” against his colleague. “Our Ministers have stayed back in Kodagu for weeks to oversee relief operations along with the District Administration. You should extend to them the same respect that they extend for the help from your end. It was disappointing to see you lash out at my colleague,” he said. OUR GREENERY IS GONE, BUT OUR OLIVE GREENS ARE STILL FIGHTING. AND THE POLITICIANS ARE ANGRY. Defence Minister was pulled away from a discussion with retired Kodagu army officers who were telling her that it is important for Kodagu and River Cauvery to be protected by the implementation of the Kasturirangan Report. That shows that the politicians are still planning to bring railways, highways, urban expansion, mini hydel projects, airport, more resorts and homestays and more mass tourism to cut lakhs of trees. Please say goodbye to your Cauvery water supply. only politics and nothing else, going hammer and tongs against the central gov for everything and any thing. the opposition want to grab power at any cost, a very negative approach, god help the people,god help nature, god help this country. When the Defence Minister was following a schedule which was finalised by the local District Administration, what was the need for Mr. Mahesh to interfere and disturb the already set schedule? What was the Mr. Mahesh scared of? The discussion on Kasturirangan Report? What was the need to rush the Defence Minister to a press conference and include a meeting with the district officials? How can a meeting with the District Officials be held in presence of the press? How many HOURS did Mr. Mahesh think the Defence Minister would spend on meeting the ex-Army men? With such kind of a stand, is Mr. Mahesh not lowering the respect for our Armymen? The Congress party should not support their ministers just because they are from their party and also not go hammer and tongs against the central ministers just because she is from BJP. After elections, people’s welfare should be top priority. Not egos and politics. Also, waivering loans is NOT A WELFARE MEASURE. This is no surprise from Nirmala Sitharaman. She is known for her arrogance. Ask anyone about Nirmala Sitharaman in Andhra/Tamil nadu where her roots and close connections are, They all have stories to tell about her. She needs to learn how to behave with fellow colleagues and engage with them rather than shout at anyone. Glad her arrogance has now come to books for the world to see. Smriti Irani used to do the same when she had got a high profile portfolio. We all know what happened and how she is being sidelined after she started she started showing arrogance! Even when we are hit by a tragedy, why do we play politics? What Karnataka minister has done is to stage a drama to win some browny points with his bosses. Unfortunately those who have voted him do not realize what harm he has done to our state. He managed to divert the attention from disaster to getting recognition in petty ways. Despite whatever he does he will get elected. After all he is the same minister who takes up the great project of removing race course in Mysuru to convert it into a commercial or residential plot and destroy the green space we have in Mysuru. Will voters punish him by rejecting him in the next election? Fact is that Nirmala Sitaraman is very arrogant & disrespectful to everyone other that the BJP. S R Mahesh is no better, no sooner he became a minister his arrogance has hit the roof. In a way he deserved what he got.